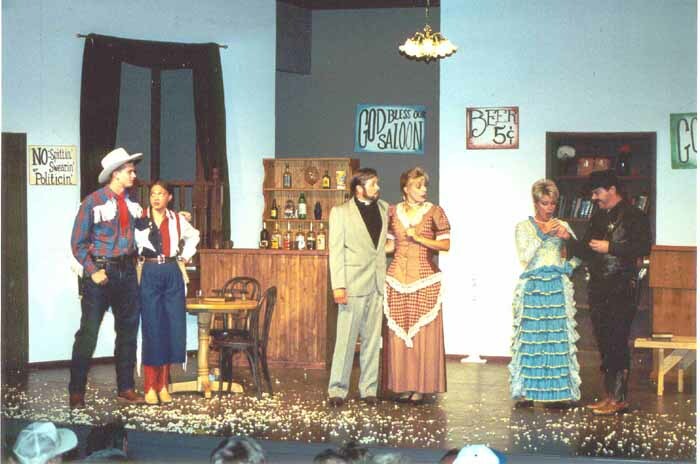 May 26, 2000, was the starting date for the eighth Mahoney State Park melodrama season. 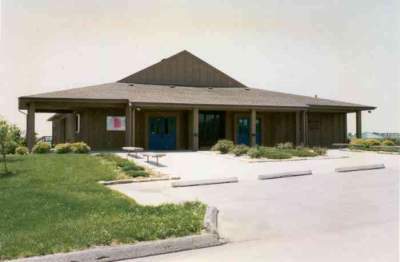 Approximately the same schedule of shows as in previous seasons was continued in 2000. Also the dinner train show and the fall season were both continued with approximately the same number of performances. Our casting of three female and three male actors remained the same as in 1999 and the same casting requirements of four actors and five respectively for the fall and dinner train shows were employed. The usual personnel changes were made to all casts, and Brian Lucas agreed to direct the train show as Ed Dill moved out of the state. D. Chapelle continued in his capacity as writer/director/actor for the fall show. 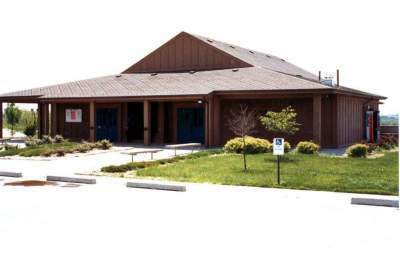 The plays selected for production at Mahoney were "The Creeper of Crestwood" and "Mary's Peril", by D, Chapelle, and "Border Bandits" by John Burkhart. The play chosen for the dinner train was "Scoundrel of Dagger gulch", an original written expressly for the train by D. Chapelle. The fall season ran a total of 10 weeks and has proven to be very popular with Park visitors. 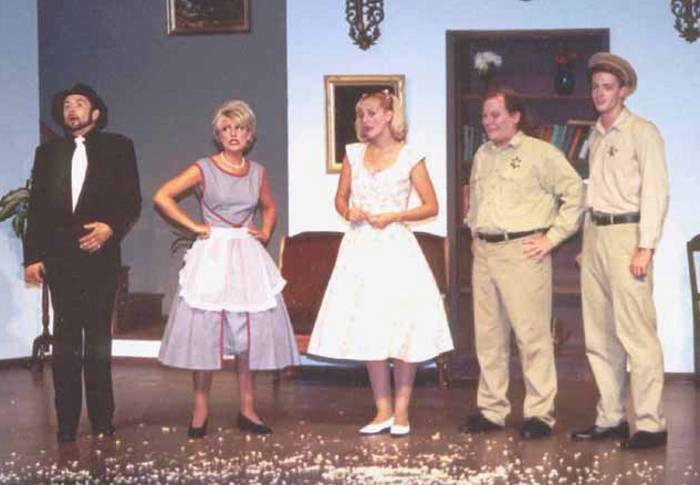 Five actors were cast for this show, two female and three male. The play chosen for the fall was "The Baron's Revenge" written by D. Chapelle. It was also decided to add a piano player for the first time. 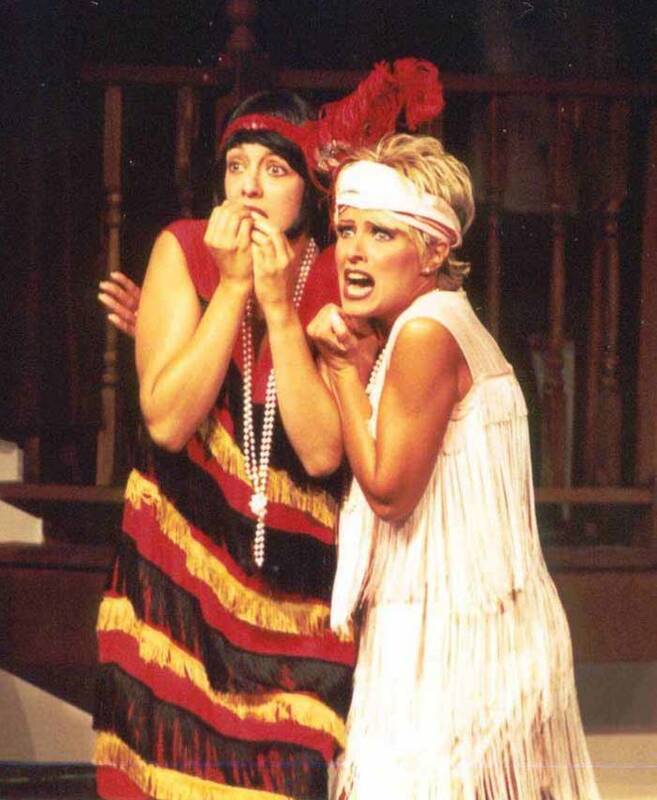 Linda Laessle and Lynette Zimmer, both veteran performers from past seasons, shared the duties. The Cast of "The Creeper of Crestwood"
The cast of "Mary's Peril"
Sandi Hills ........Kristine Kapustka The cast of "Border Bandits"
Bitsy Caprice (Jade Lewis) and Kristine Crestwood (Kristine Kapustka) are frightened by...The Creeper of Crestwood! Pictured left to right: Villain J. Alvin Acne (Fred Gartner), vamp Sandi Hills (Kristine Kapustka), heroine Sweet Mary Rogers (Jade Lewis), hero Sheriff Horace Witless (Dana A. Wheatley) and side-kick Side Kick Jones (Scott Dunn) Pictured left to right: Hero Donny Dynamite (Scott Dunn) Heroine Marie Marie (Kaili West) Reverend Hugh Boring (Fred Gartner) saloon owner Libby Libation (Jade Lewis) Saloon Lady Trixie LaRue Jones (Kristine Kapustka)and villain Dastardly Drygulch (Dana A. Wheatley). Heroine Emma Wright (Kristine Kapustka) is menaced by the villainous Baron (D. Chapelle) and his evil assistant Rogi (Vicki Clark).